Clarity's own Dan Castleman, Co-founder and Director of Analytics, has been featured in the recently published eBook, Data and Democracy, available for free download (via O'Reilly Media). As the Director of Analytics, Dan is at the forefront of Clarity's mission to providing fully integrated analytic solutions to Democratic campaigns and progressive non-profits. Data and Democracy, edited by Andrew Therriault, former Director of Data Science for the Democratic National Committee, features eight curated essays from experts on both sides of the aisle that focus on the use of data science in the 2016 United States elections. Dan's essay, entitled, "Essentials of Modeling and Microtargeting," describes the differences between modeling and microtargeting, the basic strategy for implementation that drives their use in modern campaigns, and a few common examples of the modeling techniques developed at Clarity. In his essay, Dan makes it clear that models, that often use polling data from as many 20,000 individual voter responses, are most effective in improving the long term efficiency of campaigns, as opposed to "horse-race" election polls that might use as few as 400 responses to illustrate short-term candidate support for a closely watched race. Deciding which models to build for a particular campaign stems directly from the targeting needs of the geographic area in question. According to Dan, "it is not just important to identify whom voters support and whether they are persuadable, but also whether or not they will take their support to the polls." To help illustrate this argument, he created an illustration that groups populations of voters based on their candidate preference and likelihood of voting. "This strategic thinking explains why turnout and support scores are the most common (and in many cases, the most useful) models for campaigns." To learn more about the Clarity products featured in Dan's essay, and for a full list of models available at our firm, visit our catalog at http://www.claritycampaigns.com/services. In celebration of 4/20, we'd like to highlight the release of our new Marijuana Reform Support model! The model predicts an individual’s likelihood of supporting marijuana policy liberalization. Click on the map below to see where the most people would support laws that allow them to celebrate! highest support for laws that allow them to celebrate! The Trace, a non-profit whose mission is to expand news coverage of guns in the United States, quoted Partner John Hagner for a recent article. The piece features our Gun Violence Prevention Scores as evidence for why Clinton's embrace of stricter gun policy matters in the race for the White House. Today, The Hill published an op-ed written by Clarity's own John Hagner and Paul Tencher of MWW PR. "The Truth About Primary Voter Turnout" is a response to recent claims that primary turnout could spell trouble for Democrats in November. This is what cable news pundits want you to think: Thanks to surging voter turnout in Republican primaries—and lagging Democratic turnout—the GOP is expanding their base to historic levels, which will propel their party to winning the White House. Unfortunately, the need for speed and campaign spin hides the truth that is publicly available in voter turnout data. Our data driven research finds that Democrats should be confident in their November coalition and Republicans shouldn’t be measuring the West Wing drapes anytime soon. With less than a month to go before the first votes are cast, the 2016 cycle is heating up. It seems as if this year more than ever candidates are touting polls on the campaign trail. Coinciding with increased campaign rhetoric focused on polling, Pew Research recently published a fascinating study testing methods pollsters use to identify likely voters. Pew concluded that rather than relying on voters to self-identify, verifying whether or not someone actually voted by matching respondents back to the voter file is significantly more accurate. 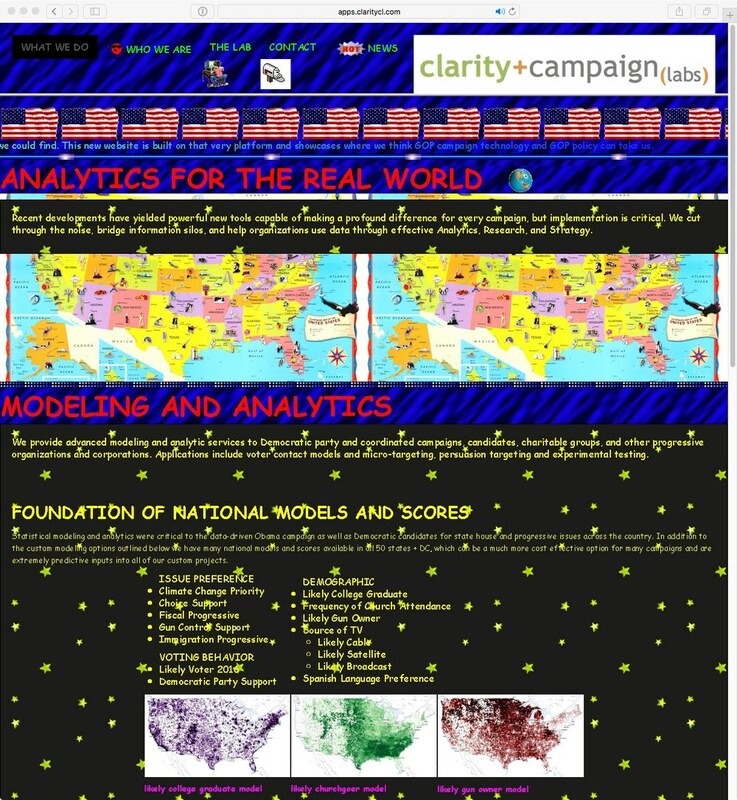 Clarity’s work was featured in Section 2: Measuring the Likelihood to Vote. Pew Researchers used TargetSmart’s voting file, which aggregates official state-level data and voting records, to verify respondents voting history. Their data contains a voter likelihood score developed by us here at Clarity. The Washington Post praised Clarity for having a “strong likely voter model,” and Pew Research found that models such as ours provide more accurate predictions of the eventual electorate. For more on likely voter models, read the full report by Pew Research Center here. Be sure to check out the Washington Post's full article as well. New for 2016, we developed a proprietary tool, called the Clarity Portal, to take all of your surveys and make them easily accessible and customizable. Our tool takes weighted raw data from any polling firm not just Clarity and creates toplines and crosstabs that are securely viewable from any web browser. You can learn more on the Portal page in The Lab, and submit your information below to request a portal demo login. The Environmental Voter Project, a nonprofit startup, is playing a longer game, seeking to coax more supporters of environmental causes into the political process. The goal isn’t to win elections, but to change the overall electorate so that progressive environmental policies are given greater voice. “If you dramatically increase voter demand for a particular set of issues, politicians will respond,” said Nathaniel Stinnett, the project’s founder and a veteran campaign strategist. Using both predictive voter models and public voter files, the group is targeting people who do not regularly vote but rank the environment as a top political issue. Earlier this year, researchers for the group found that nearly 16 million people who identify as environmentalists did not vote in the 2010 national elections. A September survey in Massachusetts estimated that 277,000 environmentalists sat out the 2014 governor’s election, and that nearly 100,000 weren’t even registered to vote. Read more about our work with the Environmental Voter Project: Group's Goal is to Get Non-Voters to the Polls.